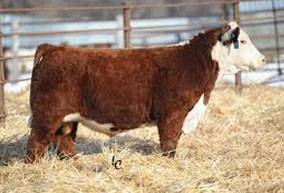 Homo polled, maternal brother to deceased TH Mr Hereford 11x and $230,000 high seller, TH 71U 17Y Mountaineer 420A. Early calf reports from Topp are unreal! Low birth, tons of vigor, dark red and heavy pigment. Use on About Time & 719's.